Goodreads Description: Riley Vasquez is haunted by the brutal murder of the couple she was babysitting for. 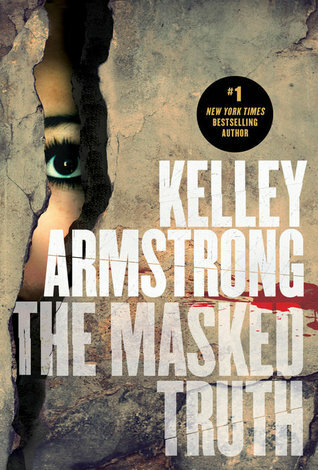 My Review: Kelley Armstrong’s The Masked Truth is a step away from her normal work in all the right ways. She steps into contemporary/thriller territory with the story of a therapy group held hostage by masked men. The ultimate strength of this book, and something that made me extremely happy, was the look at trauma, mental health, and mental illnesses. The main character, Riley, has undergone horrible trauma after losing her father and then being witness to the couple she baby sits for getting shot. Instead of sending her into a spiraling mess, the author does an excellent job in balancing Riley’s strength with her weaknesses. Yes, she is prone to panic attacks, flash backs, etc., but finds ways and reasons to stay strong and push through it. It’s such a delightful thing to see. Riley is a strong character, there’s no doubt about that, but you get to see she has to work for that strength. It creates a powerful message for any readers who may have undergone trauma themselves-- that strength is something you can cultivate through perseverance, and even when you feel you’re about to fall apart, those dark feelings can be overcome. Through Max, the book’s secondary protagonist, we get to glimpse a little deeper down the rabbit hole. Max is diagnosed with Schizophrenia and takes medication for it. At times, he isn’t sure what’s real and what’s imagined, and it seriously affects his self-confidence. Near the beginning of the book, I felt that the author focused too much on the label of Schizophrenia. The beginning is very clinical in the way that it lists symptoms and goes through the checklist of what Max has and what he doesn’t, which distanced me from the disorder more than it made me understand it. Later on in the book, more through the middle and definitely at the end, the author goes into more detail about how Max’s diagnosis makes him feel, how that label interferes with his life, and the consequences of having to cope with this illness. I felt like the emotion behind it made a bigger impact than listing symptoms and throwing around the clinical side of it. The book could have had more power if the situation was reversed-- if we started with Max’s emotions and how he feels living with it, and then move more into the clinical side of explaining everything. That way, we would have experienced Max’s illness the same way that Riley had, which also would have built a stronger connection between Riley and the reader. If you’re a sucker for tension, this book is a must read. It doesn’t take long at all to launch straight into the hostage situation, which instantly turns the tension up to the max. I couldn’t bring myself to peel away because even when I thought the author would slip into kidnapping/hostage tropes, the story turned in the opposite direction and threw me for a loop. A twist about mid-way through had me texting my friend with many swears and capital letters and general freaking out-ness. The plot and the way it was handled got me excited in true thriller fashion. As well, the romance between Max and Riley was developed in a believable and excellent way. It’s more than just being trapped together that pushes them together, it’s the strength and determination to survive that connects them. My biggest complaint with romance in YA is often the unbelievable relationships; sometimes love interests are drawn to the main character for literally no reason. But the author clearly shows the reasons that Riley falls in love with Max, which in turn makes me, as the reader, fall in love with him too. As with many of Kelley Armstrong’s books, her writing style is thin on description. This allows for the action to move faster, but doesn’t give you a very real sense of setting. As Max and Riley spend a chunk of the book running through the warehouse their therapy group is in, the creepy factor could have been amped up by making the setting a character in its own right. As well, I had a problem with the focus on Riley. Within therapy before the tragedy starts, all the characters seem really fixated on Riley, how “brave” she was, the ethical implications of what happened (was she a coward or wasn’t she), and so on. Even after the horror starts, characters are still overly focused on Riley and her past trauma, and how she must be “holding up” through all this. I found this highly unrealistic. Most people only focus on themselves, and if these kids have big enough issues that they’re at an overnight therapy group, then they have more important things to focus on than a stranger’s problems. I could have excused this if more characters had the spotlight. Sure, we shine the therapy spotlight on a couple other characters for only a few moments, but it pales in comparison to the amount of time everyone else is discussing Riley, her well-being, how she should be one of the first ones out, etc. Made the whole narrative very MC-centered. If more time was spent discussing other character’s issues as well as Riley’s, it might have been more believable. My final issue came with the ending. No spoilers, I promise. The plot itself wrapped up nicely, and I really enjoyed the ride. It was the note the author left off on that didn’t really sit right with me, as not only was it very heavily implied meta commentary, but it just didn’t fit with the rest of the book. The end leaves off with two characters discussing writing a story, where one talks about how he wants to end his story. He used Riley as a base for his protagonist and comments that the dark ending to stories just doesn’t do it for him, and he wants to make her happy. I understand the sweet note that the author attempted to leave off on, but I didn’t feel the writing analogy was properly presented throughout the story. It left the ending very out of place, and all I could see was the author commenting through her characters. It almost felt like a “moral of the story” ending. I wish that it had been something else, because the book was overall amazing, but that last chapter left me with a weird taste in my mouth that’s hard to shake. TL;DR: All in all, 4/5 stars. An incredible plot and wicked tension plus awesome take on mental health equals a happy me.